Moel-Y-Parc television transmitter is located 15 miles WNW of Chester and was opened in 1963. It is a cable stayed structure around 240m in total height, see How High is High ? Moel has a population coverage of about 300 thousand, though I can`t help wondering if the latter figure varies according to whether it`s the holiday season ! It must be pointed out that quite a high proportion of those within Moel`s coverage area choose to watch the programmes broadcast from English transmitters (e.g. Winter Hill) which is easily spotted by which way the aerials(s) face. Whether this is due to a lower Welsh content is a question I would prefer to leave to the reader to answer but I do wonder if this was also accounted for when the coverage figure was arrived at ? The structure is built near the top of a mountain (the actual site height is 340m) and anyone visiting it will be rewarded with fabulous views, particularly if you walk up to the Trig point just behind it. 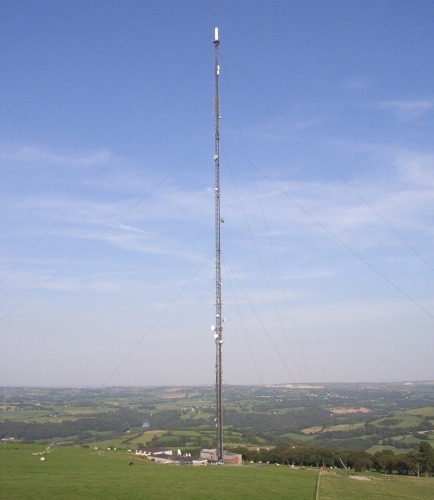 As a main transmitter Moel Y Parc is horizontally polarised and is a B group, it also has twenty smaller repeaters to improve its signal coverage. DSO occurred in November 2009. HDTV has been transmitted since June 2010 on MUX3 (plus the lower power MUXES 4 & 8). In addition, there are two new lower power HD MUXES (in the CH 31 to 37 gap) on CHs 32 (at 10kW) and 34. Both of these channels can be picked up by decent B group aerials. Moel Y Parc (what an evocative name....) and its surroundings. Base of Moel Y Parc showing the feeders taking the signals up to the transmitting antennas on the mast. The majesty of Moel Y Parc against the evening sun. Moel Y Parc`s frequency/channel guides also provide the same information for Llanddona, Winter Hill, Storeton, Fenton, Sutton Coldfield, The Wrekin and Conway. This data can be very useful for identifying possible alternative transmitters. The Channel Allocation Guides can also be very useful in the diagnosis of co-channel interference problems and can also be invaluable if you are trying to find a spare channel for a modulated output (e.g. for a Sky box or CCTV system) to be added to your TV setup/distribution system without suffering from co-channel. 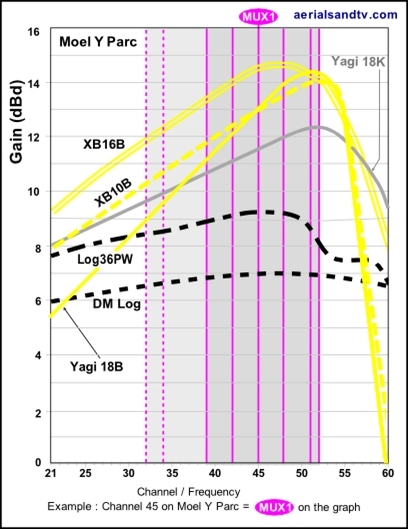 For Moel Y Parc we recommend the DM log for strong signal areas, the Log36 for medium signal areas, the Yagi18K for outdoor installs in poor signal areas, the XB10K for loft installations in poor signal areas, and the XB16K for those with the most marginal signals. Unless you have a massive loft we`d normally recommend an XB10B for loft installs (over an XB16) due to smaller size of the former aerial. The dimensions and test performance of the aerials can be found on the relevant tables. 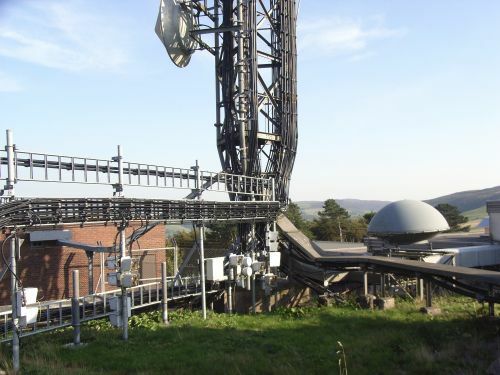 700MHz clearance is due at Moel Y Parc in Q2 2020 when technically it is due to become a K group on CHs 33 to 48 (excl MUXES 7 & 8), but all decent B group aerials will still work fine. Note Storeton Wales which started transmitting after DSO in October 2009. This will rebroadcast Welsh Language MUXES (from Moel Y Parc) in a 30 degree arc around Flint.